I'm joining in Fan Month held by Heather @ Sometimes I'm A Story. Fan Month is a time period, not necessarily a month, in which you take a break from your own blog and cheer on other people. Heather has an introductory post and giveaway on her blog. And yes, that title was an attempt at subverting the Stark motto. 1. When do you plan on being a fan? I've got a little thing coming up for my birthday this Friday, and it's likely to stretch on for a couple of weeks, so that'll be the last two weeks of March. 2. What goals will you set for yourself? I'd like to discover 10 new blogs and maybe 100 interesting posts. 3. Are you going to set any rules for yourself? Exceptions to those rules? I will schedule all my blog posts for the month and not look at them again except to reply to comments. I will read my entire Bloglovin' feed every day on the train, visit all the other people in this link-up, and stop ignoring Bloglovin' recommendations. I will not visit Tumblr except to reply to messages, check my activity for tags, and check my username. 4. Where do you plan on sharing the great posts you read? 5. Where could you be a fan outside the blogosphere? I guess the obvious answer is books. I'll rate every book I read and review whenever possible. And I'll look for a Wattpad/Figment link whenever I'm wandering around the blogosphere, so I can comment on unpublished works too. 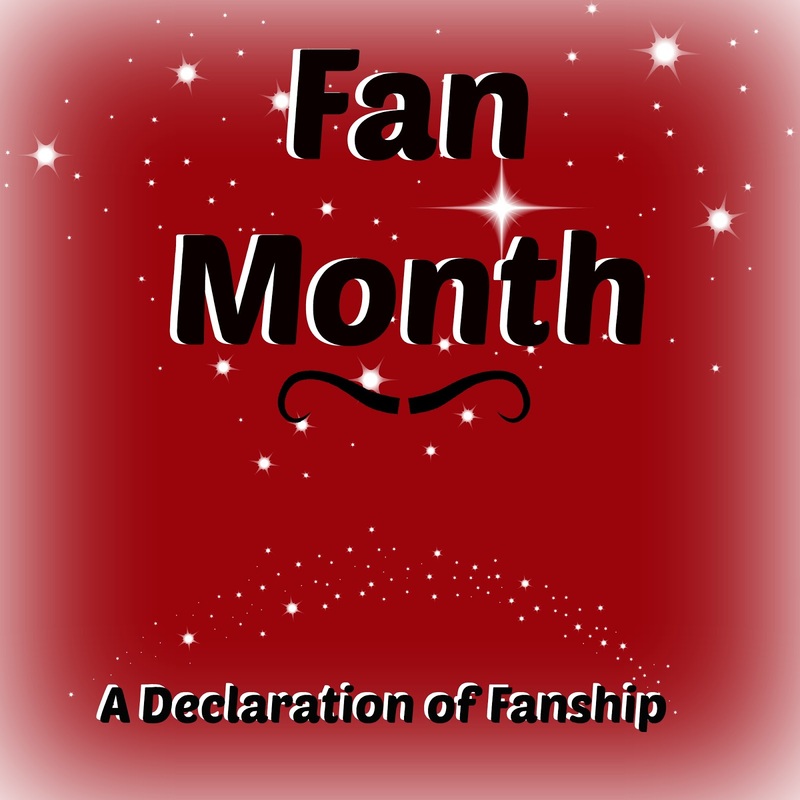 Are you also participating in Fan Month? How could you be a fan? Share in the comments! What a sweet idea. My favorite part of blogging is meeting others, so this sounds like a fantastic party. I'm super excited for this too! I figure rules are better instead of telling myself, "I will flail over everyone's posts and not flail on the blog myself." This is a really fabulous idea, so thank you so much for hosting it, Heather! Literally I just noticed that you made a Game of Thrones reference in the title and I DIDN'T EVEN PAY ATTENTION TO THAT. YES. YES I DID. (It was sort of a crappy reference, so ... not your fault. Wow, you're being so organized with this, Alyssa. I'm definitely going to do fan month, but I have no idea what rules I'll be setting for myself. I guess I have some things to think about. Thank you! I'm really excited to see your declaration post, then :D Do check out everyone else's post for ideas how to be a fan yourself! And Heather posted just yesterday on some ideas. The main issue is to identify where in the interwebs are you interacting for yourself rather than for everyone else, I think. This is awesome! I admire everyone being better fans. XD I...I'm struggling for time atm, or else I would be absolutely joining in. And good luck scheduling, too! I used to be awesome at scheduling like even 2 weeks in advance and now I usually schedule a post the morning before it goes up. haha. That's okay too -- if everyone joined in this, we wouldn't have things to be fans of XD *whispers* I actually have blog posts scheduled up to May. I didn't study during last Christmas. Hi SharM! Alyssa technically isn't my "real" (read: official, on-birth-certificate-and-ID) name, but that's what I'm called around here :D I don't think your comments went into spam, which probably just means Blogger is being weird. I will try to rectify this -- thanks so much for letting me know! In the meantime, if the Blogger profile is inconvenient for you to use, just select Name/URL in the dropdown menu and fill that in. And I'm so happy to hear that you enjoy reading my blog and have been doing so for some time! When I started out, I was also really lost, because I didn't know I should be checking out other blogs. Yours, of course, is one I shall look at now! I'm glad you enjoy the non-Western focus on the blog. It's the first time I'm trying this and I've been receiving several positive responses, so I will definitely be continuing this. I'm so excited for how many people are doing this! It's an awesome way to share blogs and come in contact with new bloggers. So am I! It's definitely going to be fun. Hope to see you around during Fan Month! I'm up for tweeting with #Fanmonth! Good idea. And I like the rules you set for yourself. I would have set rules for myself, but I'm not the best at keeping them....so I just do my best! This is officially the COOLEST THING EVER. I'll be stalking the #FanMonth hashtag on Twitter, so I can't wait to see you there :D I think it's such a great idea to read your blogs on the train, by the way - I tend to forget to check my feed daily (or push it to the end of my priorities list), so I should probably schedule a time as well, even though I'm not participating in this! I KNOW RIGHT. You can still join in, I think, although the giveaway is over. It's definitely a great idea to block out maybe half an hour for this; I tend to do it all on the train! This is a really neat idea. Wish I could figure out how to add my blog to bloglovin. Any tips? Have a super, fantastic, awesome, splendid, amazing day! Thanks, Eliza. You have to add a snippet of code in your blog post to do that. Another Fan Monther! You're so much more organised with your blog preparation than me obviously. I'm taking my Fan Week this week, and I haven't scheduled a single post, even though I totally meant to. Sounds like you're going to have a super organised and productive Fan Week/s. Good luck!